Environmental Protection Agency Administrator Scott Pruitt said on late Thursday that it was “insensitive” to talk about climate change as Hurricane Irma bears down on Florida. 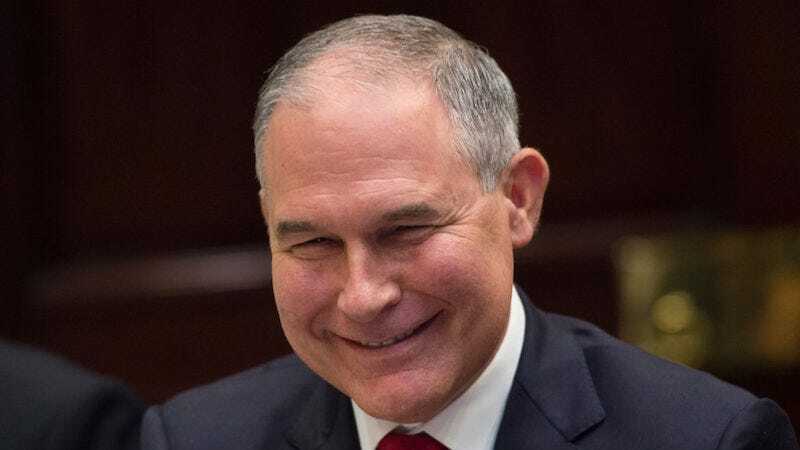 Pruitt added that he was focused on ensuring that waste from the 53 Superfund sites located throughout the state didn’t leak into Florida’s water supply. He added too that the EPA was “working in advance with the owners of those sites to secure those sites.” Pruitt did not elaborate on the EPA’s plans nor did he discuss his July recommendation to drastically cut the EPA’s budget, a plan that many experts in Florida have argued will not only slow the process of cleanup but prevent new sites from being added. Pruitt also told CNN that the EPA was working to bring more fuel into the state post-Irma but again declined to address the effects of climate change. “All I’m saying to you is, to use time and effort to address it at this point is very, very insensitive to [the] people in Florida,” he said. What’s increasingly clear is that there is, apparently, no good time for Pruitt to discuss climate change despite the fact that Florida—particularly South Florida—is extremely vulnerable to its effects. As I sit in at my parents’ home in Broward County (my own is in an evacuation zone)—windows covered with hurricane shutters and water hoarded into every possible container, waiting to see if Irma is going to be another Wilma or another Andrew—I would quite like to talk about the effects of the rising ocean temperatures in a region that houses millions of people. I would love for Donald Trump to acknowledge that climate change isn’t a “hoax” and for Rick Scott to also acknowledge that man-made global warming is real instead of banning the phrases “climate change” and “global warming” from being uttered in state agencies. This seems, at least to me, more “insensitive”—more “opportunistic,” even—that discussing the devastating effects of climate change.